As someone who is always working on multiple customers, it’s been maddening to store multiple S-User id credentials for various customers on notepads, clearing cookies on browsers before switching to another customer support portal, create new S-User ID as and when team changes, additionally as a project manager deal with the displeasure of my subordinates when I ask them to use their unique customer created S-User ID to raise product issues. SAP has finally worked on the enhancement request I had put in several years back, which had then gone unnoticed as it was not something customers experienced or really were eager for and so did not get enough kudos. I am not completely happy with the solution will explain why a bit later under disadvantage hopefully as it’s still in a pilot release they may address my concerns in the final release. You are reading this blog most likely because of the hyperlink on my earlier blog https://blogs.sap.com/2018/12/24/fundamentals-of-s-user-id-for-new-successfactors-customers/ mentioning about the Manage Service Partner User Application tile. 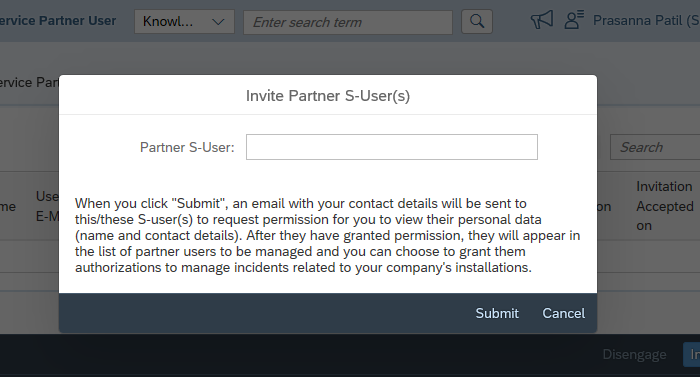 As a customer you no longer have to create brand new S-user ID for partners resources under Support User Management in the SAP ONE Support Launchpad, you can directly grant access to existing partner S-user ID to create incidents. Disadvantage: Partner resources will only be able to access incidents they have created, if the customer has put in a refresh request or logged any other issues partner resources cannot see them. My opinion partner consultants should have access to all issues, not just issues they create. authorize SAP and customer to share their personal data such as name, telephone number, title…. Unfortunately at the moment I cannot use properly this feature: I successfully added a new S-User for my partner, I can set the validity period but the checkbox for incidents and cloud are disabled, I cannot assign the access to the partner.